Under the oak at Mamre, Abraham entertained heavenly messengers. Desert hospitality required one to offer refreshment, yet he was eager. Sharing food is delight, generating fruits of unity. 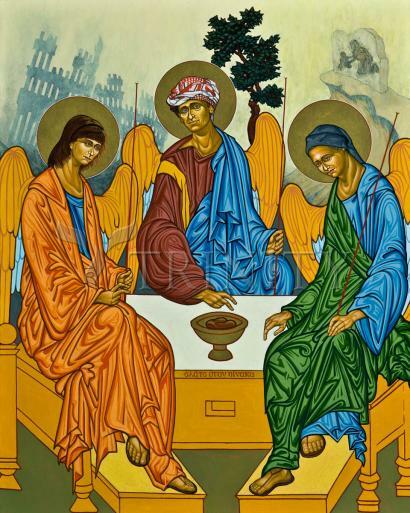 Where two or more are gathered… In this icon, (the prototype, The Holy Trinity icon by Rublev), the messengers are for our times. In the center is Tom Fox, a 54 yr. old, peaceable, ex-Marine musician, father of two who served 3 missions in Iraq with the Christian Peacemaker Teams. Two nights before he was kidnapped, Tom was inspired as a Quaker to lead his friends in celebrating Eucharist, which was not part of his tradition. This, I feel, manifested his faith that all shared one body. Months of kidnapping ended with Tom’s murder March 9, 2006. The figure to the left is Margaret Hassan, a 59 yr old Catholic Dubliner who married an Iraqi Muslim and moved to Iraq. For 30 years, through the Iran –Iraq war, 42 days of Gulf War carpet-bombing, 13 years of crushing sanctions and the current war begun in 2003, she served the families and suffering children that were her new family. She served as head of Care International in Iraq for years when shockingly in Oct. 2004, she was kidnapped and likely shot to death Nov. 9. Her body was never recovered. The background in this icon commemorates the 9/11 attacks and the Al Amariyah Allied bombing of Bagdad, 1991, where a civilian shelter was targeted, incinerating 408, the heat of which left carbon prints of women and children on the walls. War, economics, aggression, twisted fervor seeking God’s favor in fulfilling His ‘will’; these new messengers reaffirm; they shout truth in response; it is in compassion, in dialog, seeing neighbor, sharing at table, WE ARE ALL ONE BODY!